Grand Central Life & Style, 9781478918165, 256pp. If you asked people to post a status update on their relationship with food, most would say "It's Complicated." We aspire to eat healthfully but find ourselves making hasty food choices driven by stress and convenience. Or we treat ourselves to a decadent dessert but feel so guilty we don't even enjoy it. The truth is we can't make good food decisions if we don't deeply examine our relationship with food. 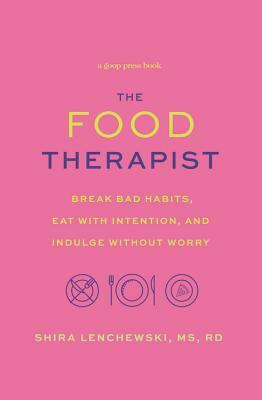 In THE FOOD THERAPIST, Shira Lenchewski offers readers an ongoing one-on-one food therapy session, revealing the root causes of our emotional hang-ups around food and providing the necessary tools to overcome them. This practical and judgment-free guide helps readers hone the skills needed to put their get-healthy intentions into daily action, such as planning ahead wisely, tuning into their fullness cues, and harnessing willpower (even when life gets messy). Lenchewski also offers easy-to-follow, tasty recipes aimed at rebalancing our hormones and conquering our cravings without deprivation. THE FOOD THERAPIST is a refreshingly modern resource that helps us finally un-complicate our relationship with food and our bodies. We can then focus our efforts on making thoughtful, healthy choices, day in and day out, which serve our ultimate goals, whatever they may be. Shira Lenchewski, MS, RD, is a registered dietitian and a nationally recognized nutrition expert. She is the resident nutritionist at GOOP and has been featured in magazines such as Shape, Glamour, Seventeen, O, The Oprah Magazine, and Bon Appétit, and on sites like Refinery29, Lenny Letter, Man Repeller, LaurenConrad.com, Well+GOOD, and POPSUGAR Fitness among others.